Artwork Panel: 52.6cm x 97.8cm ≈ 20¾" x 38½"
Silk/Brocade: 61.6cm x 153.6cm ≈ 24¼" x 60½"
Width at Wooden Knobs: 70.6cm ≈ 27¾"
This has some black overspray on the left side near the fishing line. It cannot be seen in the image. In real life, you need to look for it to see it. Not sure what it is, maybe just a brush was flicked or cleaned at the artist's studio and a little mist got on this painting. This minor issue has forced me to dramatically discount this wall scroll. 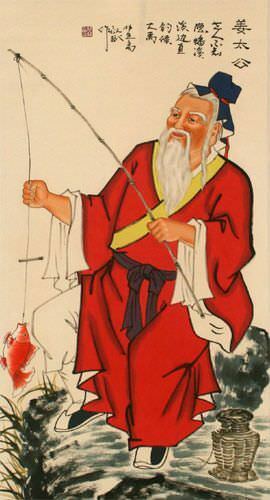 This depicts an old man enjoying a fishing trip. This old man is Jiang Ziya sometimes known as Jiang Tai Gong.